the one about the time I got crafty. Anyone who knows me really well will agree that I am creative, but certainly not crafty. I mean, I have the means to be crafty but certainly not the patience or organization. Which is why you won’t find a “crafty DIY” board on my Pinterest profile. However, you may find a “Pay someone else to do this for me” board someday soon. I also don’t do the whole Elf on the Shelf thing. Bravo that that’s your tradition and way to go with all the super creative hijinks your various elves get into, but y’all? When it comes to December I’m lucky everyone is still alive come Christmas morning, I don’t have it in me right now to keep my children entertained by some elf who poops marshmallows (eats marshmallows and poops jellybeans? I don’t know.) I know my limits, and given how often I’ve forgot my tooth fairy duties? Those little elves can stay on your shelves. I should also say I am much more likely to complete a craft it involves a glue gun. Oh how I love the glue gun. 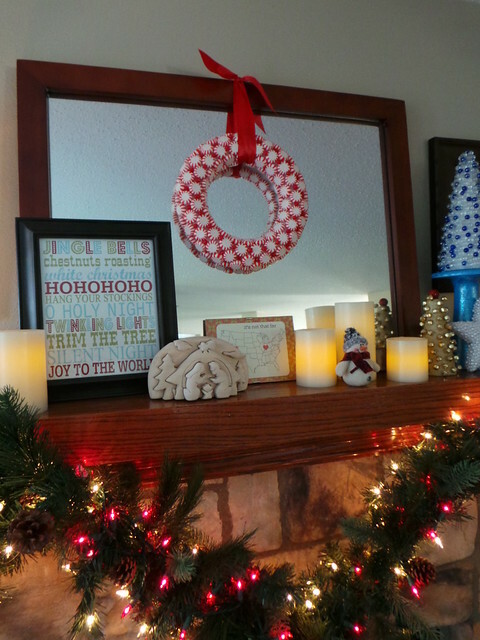 I used a smaller wreath form since it was going on a smaller mirror and I bought four bags of mints, just in case. I also ended up going around one more time and I sprayed the thing with Mod Podge Sealer in case the thing decided to wilt on me for some reason. Verdict? LOVE. Super easy, super cute. Fourth! 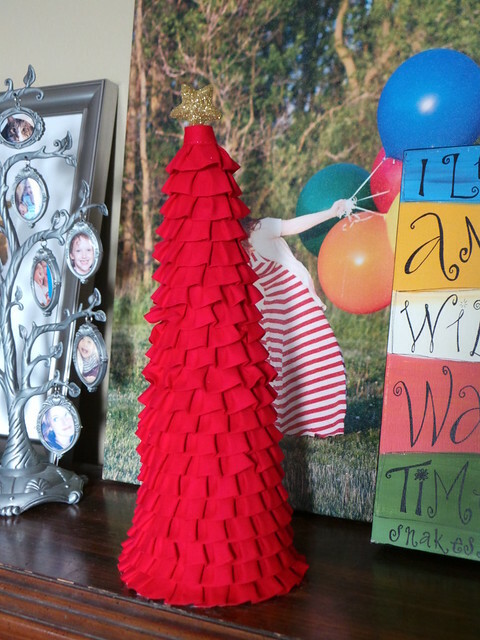 Red Ruffle Trim Tree! 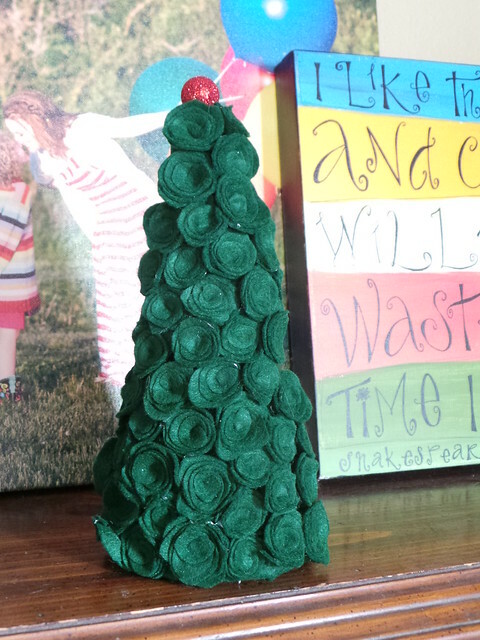 Okay, so this one came about when I saw the trim on a spool while looking for ribbon to make this ribbon tree. The red color was just right, it went with the other trees I wanted to make and so I did. It took 5 yards of the ruffle trim to cover a 12″ tree. I just used regular old straight pins to attach the ribbon. I also cut each piece rather than continuously looping it, starting and ending each row at the same place in the back. 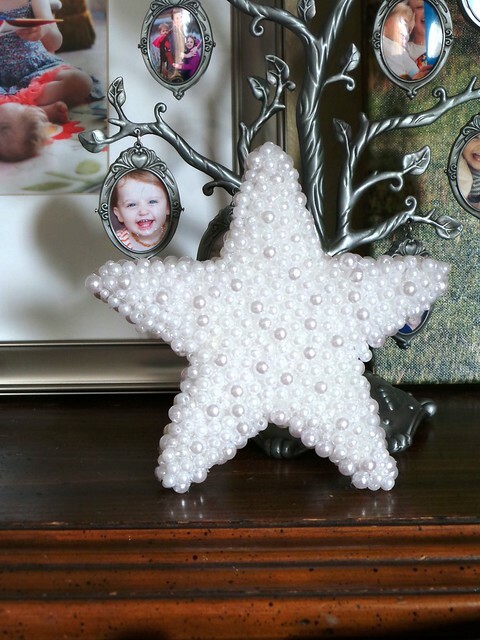 I topped it off with a little glittery gold star ornament. LOOK! A TUTORIAL PICTURE! Verdict: It was certainly the easiest to make, it’s also very cute. Fifth! Gold Jingle Bell Tree! Made this one up too. 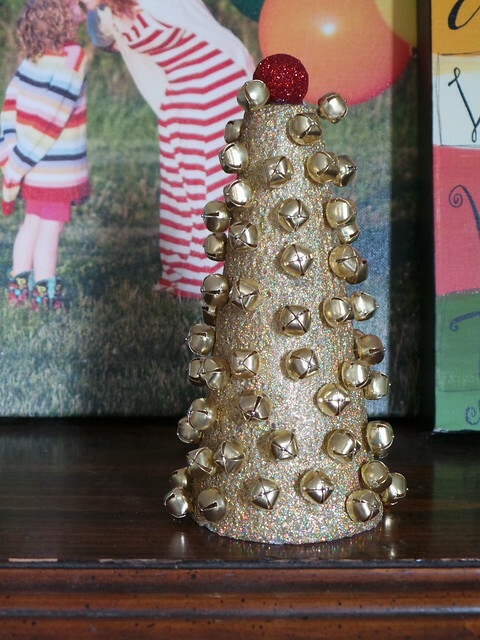 I liked the idea of the bells, so I covered a short tree with Mod Podge and poured gold glitter all over it. Eh, it’s not my favorite, but it fits in and sounds lovely when shaken. I sprayed the glitter with the Mod Podge sealer when it was dry, didn’t need my entire house looking like a glitter bomb went off. Sixth! White Rosettes Tree! 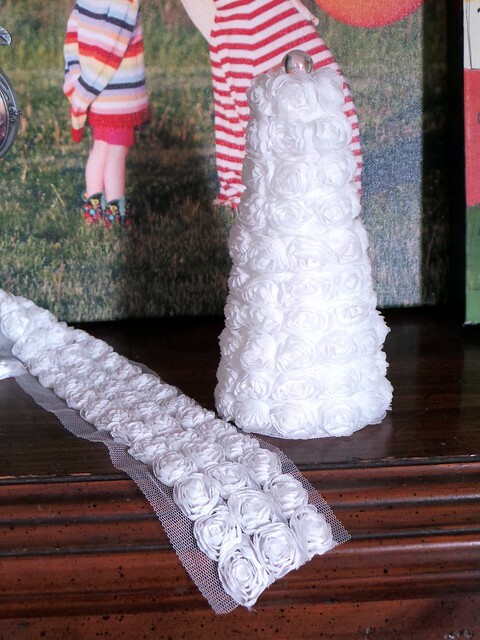 I saw this trim when I found the red ruffle trim and had to do SOMETHING with it. It’s so lacy and delicate and lovely. I used one yard to cover a 6″ tree. Verdict? Love it. (But it was certainly more expensive with the trim at $6.99/yd.) Finished off the top with a glass marble. Seventh! Marble Tree! 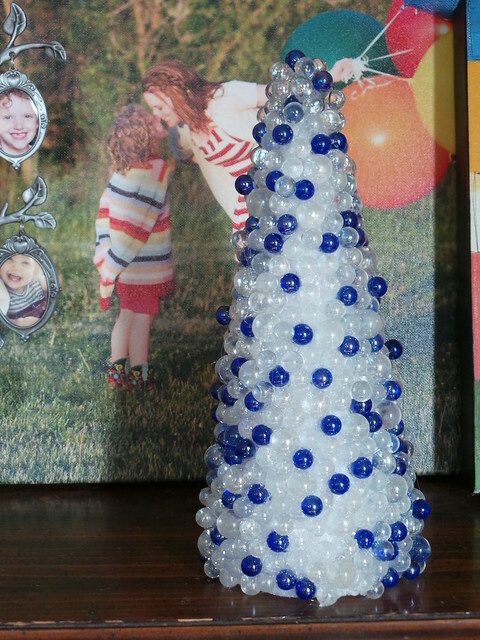 I had originally planned on making the pearl tree, but when I couldn’t find pearls I figured “Marbles! Same thing!” and bought a bag of big ones and three bags of small ones. Why the blue marbles? Because they are a brilliant shade of blue and I thought they were pretty. That’s why. This one was fun to make and I absolutely love it, the light reflects off of it and it is beautiful. The two print outs came from here and here, they are just printed on photo paper. The tall snowman lamp came from Cracker Barrel three years ago when I bought my house, he’s filled with glitter! 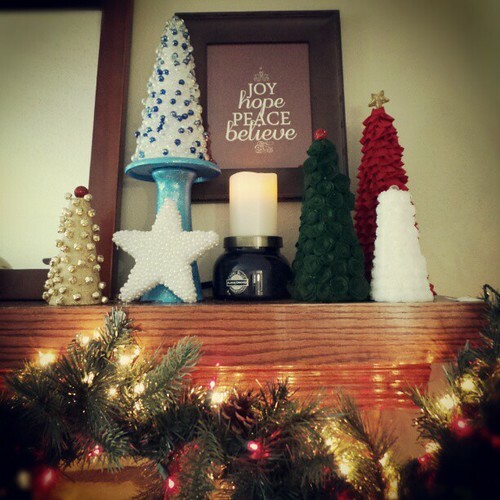 My fingers bear the scars of many hot glue gun burns, but as I stare at my mantel? I don’t mind one bit. Now to just make Christmas last a little longer so I can keep staring at them. So Cute!! 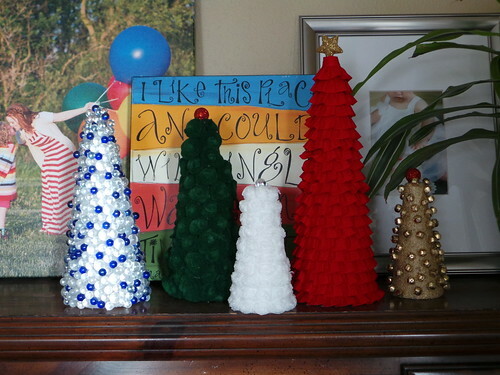 I think the red ruffle tree is my favorite. @Jamie M., It gets bonus points for being so easy. I was just saying that my mantel needed some height. I will say, though, that the gold one with the bells reminds me of the Daleks from Dr Who. I’m pretty sure they’re silver, not gold, but the same sort of silhouette. It’s not a bad thing at all! @Katie, I can’t do stinky glue. Or glue that can spill, I’ll take glue gun burns over butterfingers and spilled glue. I love those trees!! I had seen some knitted ones at target that I totally wanted to copy but that would be so time consuming!!! That ribbon one- love. I have a huge jar of old buttons I’d love to glue to one, too. PS we do the elf on the shelf- have for many years now but we have never done any of the mischief that you see today! I hope my kids never get wind of it! He just moves to a new place each night here. But even just remembering that is like being tooth fairy for 24 nights in a row! It’s work. Maybe work on knit trees for next year? In all your spare time? Christmas is a wonderful holiday. It makes me happy. @Sarah, I didn’t get into decorating until I actually had my own house and place to store things the other 11 months of the year. TAKE HEART LITTLE HARD WORKING COLLEGE STUDENT! 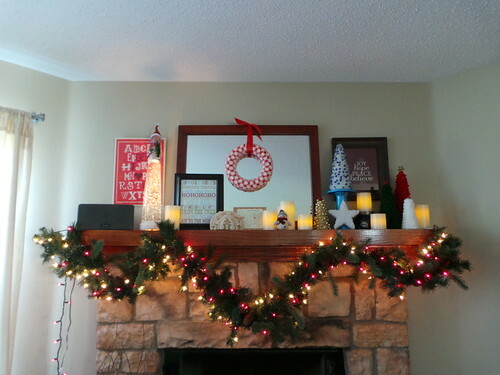 ohhh now that is one nice christmas mantle! Love it! Those are some cute trees you made, and I started doing the elf on the shelf…luckily I have pinterest, & two self sufficient daughters who are craftier than me when it comes to ideas. I laid “Miles” in a bowl of marshmallows as if he was taking a bath…not pooping! I’m not that vile! LOL! Take care Casey, and I hope you’re enjoying the Christmas routine! Those are awesome! I still could not actually do them. But you can make me a set, yes? How did you manage all of that with Vivi running around? Impressive! I may risk a case of hives to hit Hobby Lobby later. @Ronda, Nap time and once she was in bed. Otherwise it would have never happened. I love, love, love the marble tree. I’m now imagining myself buying marbles at Hobby Lobby…..
@Ami, I have so many leftover! I’LL SHARE!